Del Pilar (used, 1970) Classical Guitar - Mandolin Brothers, Ltd.
#ISI2163, with a natural spruce top, with a good quality original alligator pattern exterior hard shell case. Guillermo Del Pilar owned and operated a guitar shop in the Cobble Hill section of Brooklyn, NY for many decades. Unfortunately, there is no biographical information about the man in Wikipedia, or, that I could find, on the internet. In the New York Metropolitan area, however, he had a great reputation for making workmanlike guitars of high quality. The center of the interior paper label is hand signed by Mr. Del Pilar. The label reads: “Guillermo Del Pilar, Constructor de Guitars." This label does not have a telephone number on it – we have seen some guitars of this brand that have had the phone number. Guillermo Sr., worked in his shop on 220 Atlantic Avenue in the Cobble Hill section of Brooklyn from the 1950s into the mid-2000s. This guitar shows only light normal signs of use and playing time. It was purchased by the current owner's father who, the current owner states, played in restaurants as a strolling guitarist. The top appears to be high grade, probably select German spruce, faded, as this wood does, to a lovely yellow-orange. The wood on the back is unusual in its coloring – a uniformly medium brown with vertical grain lines (slightly darker brown) running through it. Whatever this particular rosewood variation is – it appears to be "old growth" wood – favored and flaunted as the finest in the forest. It is possible that this wood is Bubinga, also called African Rosewood – from Western Africa. Or it could be Pau Ferro - also called Brazilian Ironwood or Morado, or Bolivian Rosewood. The top is high quality (possibly German) spruce. It appears to have a South American mahogany neck and an African ebony fingerboard. The soundhole rosette is made up of three contiguous rings of wood parquetry, mostly in earth tones, with purfling rings of black and crème separating the center and main decorative and colorful area at center. Each of the sides is bound in rosewood. The top is bordered in 4 plies of varying stains of wood purfling. The sides and back are bordered in a single ply ring of crème purfling. The headstock is carved and majestic in its Middle Eastern architectural scallops and central point motif. Both the front and back of the headstock are overlain with what appears to be a dark rosewood. Behind the neck the backstrap comes gracefully down to end in a black point. The tuners are good quality with pearloid buttons and etched plates in gold plate. The ebony, neoclassical, fingerboard measures 2" at the nut, its string spacing at the bridge saddle is 2 3/16th”. THE CONDITION OF THIS GUITAR, per our head of repair, Rocco Monterosso – This is, he says, a Del Pilar nylon string guitar dated Jan. 20, 1970. It has its original tuners, original nut and frets; at one time a strap pin was drilled through and into the bass side of the neck heel (not an appropriate place) but it was subsequently removed and the hole remains. In addition, a metal strap button was screwed into the bottom side as an end pin – something that classical guitars just do not have. The bridge is original. Our talented shop of repair persons will do a standard set-up and clean up and restringing. There is pickwear into the wood on the treble side of the strings where some players mount a clear plastic pickguard (to protect the top). 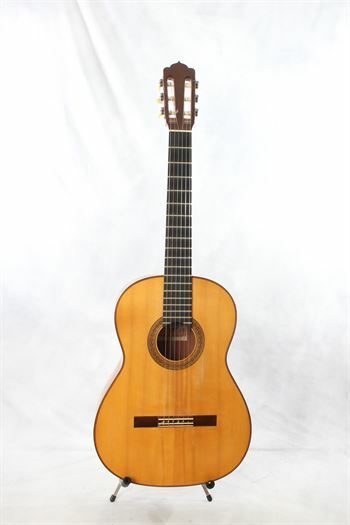 There are, overall, normal scratches, scuffs, scrapes, dings and nicks, including on both sides of the headstock, and elsewhere, but on the whole this is a very clean classical guitar in very nice condition. Visiting the builder in his workshop was one of the great experiences of the guitar-buying customer. Giullermo, sort of like John D’Angelico the archtop guitar builder did on Kenmare Street in Manhattan, measured hand-span, discussed with the buyer exactly what she or he wanted, selected the woods with the buyer and made a bespoke instrument of extremely high quality. Our SALE Discount Price is $2,785.00 and Our SALE Cash Discount Price is $2,700.00.